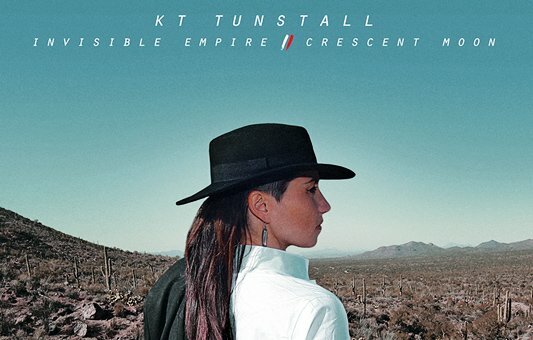 The fuzzy feelings of KT Tunstall’s optimistic radio-baiter “Suddenly I See,” a song hooked to your noggin because of your Devil Wears Prada DVD, is nowhere to be found on Invisible Empire // Crescent Moon. The Scottish songstress throws out the cute pop-girl façade and throws on a cowboy hat (literally; check out her being all Paula Cole on the cover), getting deeper into the folk zone she’s dabbled with in the past. She abandons the mainstream angling of previous work – the closest she comes here is on the rustically arranged single “Feel It All” – but sounds right at home with a guitar and her always mulled-over thoughts on heartache, heartache and more heartache. “Made of Glass” is a breakup lament that uses the title as a metaphor for the universal pain of a terminal relationship, and “Invisible Empire” is an eloquently composed rumination on rebirth. “Yellow Flower” is similarly graceful with its fairy-tale-like wistfulness; it’s the most moving song among the 13. Like the bulk of Tunstall’s surprising step back from the spotlight, these pieces are a part of the bigger picture: The album is a catharsis for dealing with the end of a marriage and the death of her father. And even if it doesn’t take to you instantly, and it’s sometimes languid, Invisible Empire // Crescent Moon is still an audacious, emotionally reaching work. Certainly, it’s her most admirable. The first time folkies Linford Detweiler and Karin Bergquist released a double album, in 2003 with their stunning masterstroke Ohio, the always wonderful husband/wife duo displayed as much talent as they did ambition. They’re at it again with Meet Me at the Edge of the World, a sprawling set of incredibly moving, gorgeously shaped reflections on life, loss, love and land. They imagine an idyllic universe on the title track, a fitting start that sets the tone for an earthy concept album bent on cherishing the time we have now and looking ahead to the hereafter. In the meantime, “Don’t Let the Bastards Get You Down” is their advice, and over just a subtle bass rumble and guitar strums Bergquist sings with quiet intensity (and Aimee Mann on backup), “Are they gonna steal my love? Are you gonna free my love?” like she’s encouraging us to keep fighting for marriage equality. Detweiler takes the lead on the second disc’s elegant piano-painted “All Over Ohio,” a charming love letter to their home state. With overarching tropes of uncertainty and mortality, these lazy Sunday-sounding songs end with a celebration of life: “Favorite Time of Light” cherishes fleeting moments of simplicity. There’s nothing simple about these songs, though; there is, however, something beautiful and poignant and near perfect about each one. If heaven were a sound, it would be this: musical experimentalist Julianna Barwick’s latest. Nepenthe, the Louisiana-born artist’s fourth release, floats about the ethers with only wordless murmurs and ethereal choral compositions that are akin to Sigur Rós at their most angelic (makes sense: the band’s producer, Alex Somers, had a hand in this, too). They mourn and cry and grieve, but always with a healing sensibility, which is especially evoked in the meditative state of “Labyrinthine.” This right here is divine intervention.